March 16th. & 17th. 2019 'Bowie's eyes' were part of my exhibition/open studio at Pataka Gallery & Museum, Porirua, Wellington. I had an open studio in Pataka for the weekend along with seven other artists. 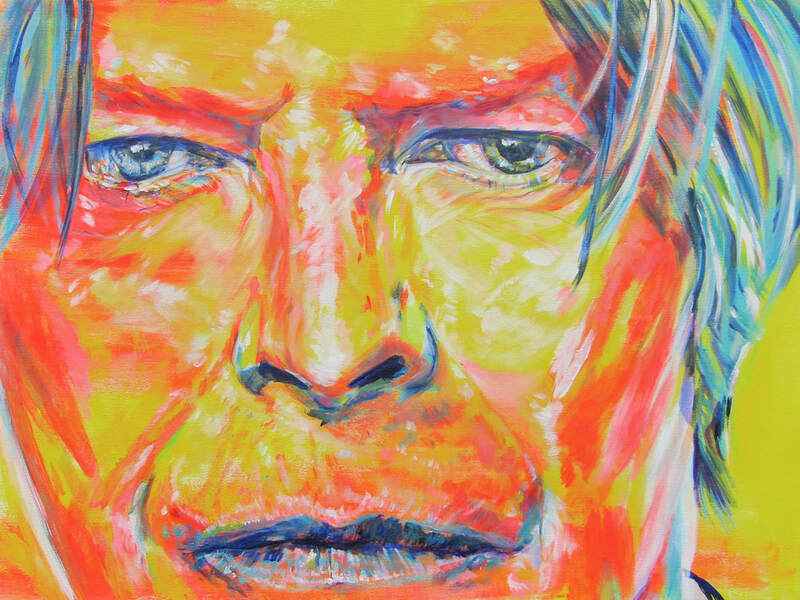 As I painted Bowie I listened to my heroes music blaring. This amazing idol of mine and his music is entwined in so many memories of my life. The weekend in the Hub in Pataka with nine of my paintings hung was filled with lovely people. Sadness often around us as Friday saw atrocities committed on our soil like never before witnessed in NZ. One lady said 'Art helps, art heals'. I saw your art over the weekend at the fair in Silverstream. It made me SO happy! I would love for you to do a painting of my dog Shade at some point. I just love how bright and happy your work is. It filled me with absolute joy! Comments like that make my day. You can't ask for more than filling someone with ABSOLUTE JOY! when they view your work. Lapping Up The Sun hangs in the home above where this beloved pet loves to sit. ​Karin is a multi-disciplinary artist living in Wellington, New Zealand. Lots of her work shows her love of 'the whimsical ' with hidden messages and symbolism behind the pieces. Her passion for movement is often a re - occurring theme, especially when working in bronze. Karin McCombe Jones was born and grew up in Wales, on the beautiful island of Anglesey. Karin has lived and worked as a teacher of the Arts in England, Canada & New Zealand. 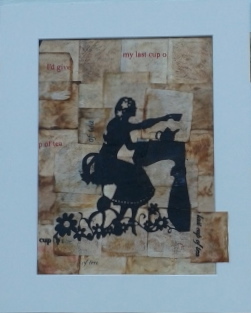 Whilst living in Canada she was part of the gallery 'Artique' in Powell River, British Columbia. In 2004 Karin and her family emigrated to New Zealand. 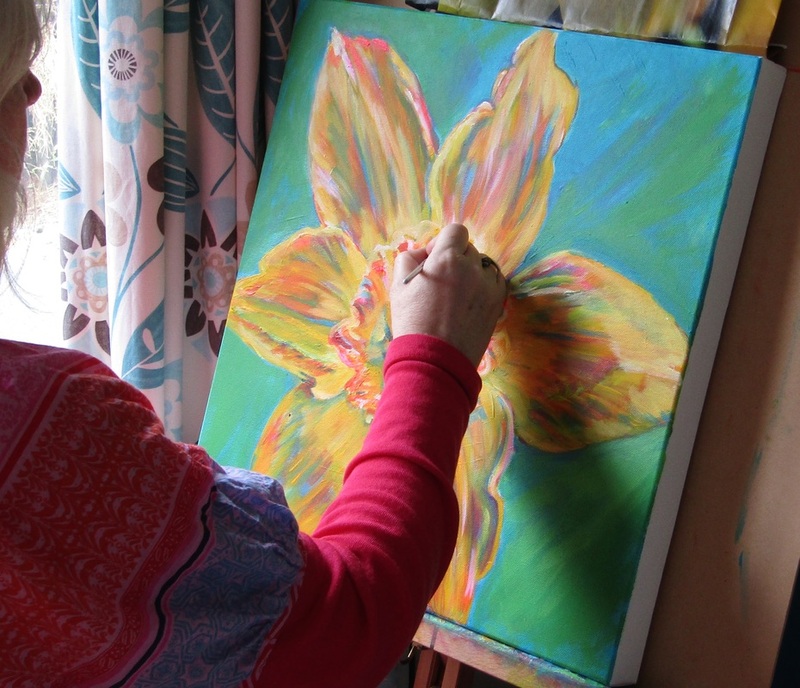 In 2012 Karin gave up full time teaching in order to focus on her own Art.. She now runs workshops in acrylic painting , encaustic wax painting and sculpting from her studio and offers tailor made 1 day, 2 day, weekly & Artist in residence packages for schools. Very pleased when I was informed I was the Peoples Choice Award Winner. I really did do a little happy dance! 'You Will Be Mine' & 'One Way Or Another I'm Gonna Get You' achieved that accolade for me. On the 31st. 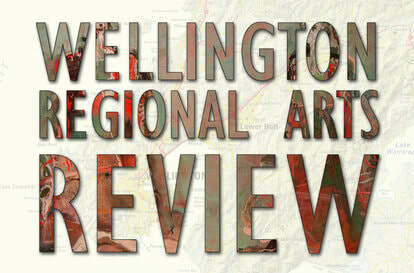 May 2018 I had received a letter congratulating me on having been selected as a finalist in the 2018 Wellington Regional Arts Review. Exciting!! 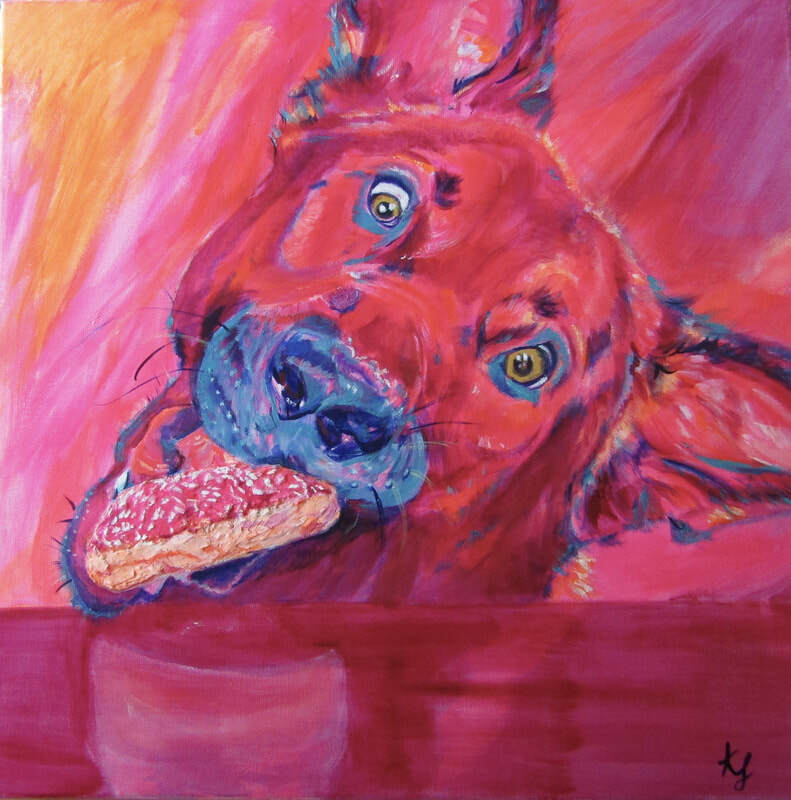 ​I had entered two of my three paintings created to coincide with the Chinese Year of The Dog. On the Awards night I had a bonus surprise at being named one of the top 10 finalists. Then to gain The Peoples Choice Award really was the icing on the cake - well donut!. 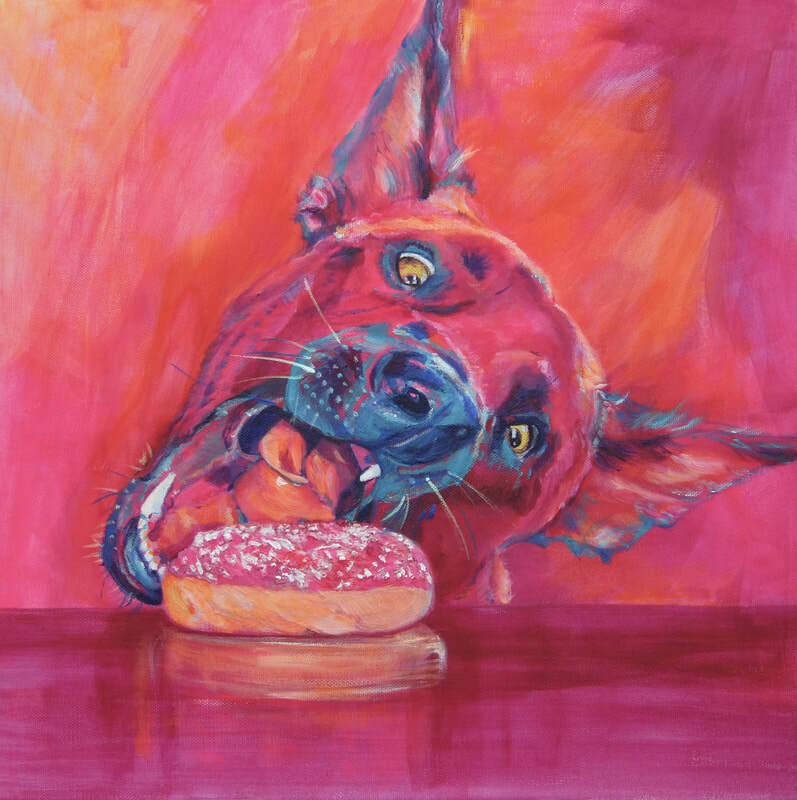 They show a Dutch Shepherd lusting for a pink donut and just having to eat it. Symbolising so many things in life we lust after, even when we know they are not particularly good for us. And the determination to get that object. Credit given to Inuk who lives in Germany and paintmyphoto. October 2017 saw some flower paintings of mine being displayed up in Taranaki to coincide with The Taranaki Garden Festival. ​Whilst in December a new and vibrant gallery in Waihi Beach accepted my work. 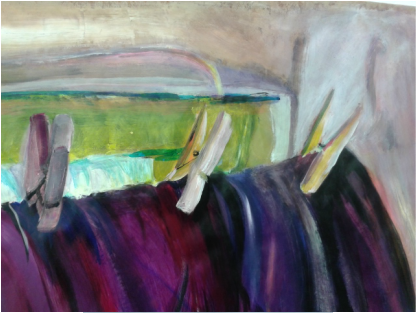 My acrylic paintings are colourful, daringly bold, and a suggestive observation of a moment captured. Being expressive in movement, brushstrokes, vibrant & watchful of reflective values in thought and light. When teaching I implored students to be expressive and dynamic in movement and facial expressions. I am now this in my art .
" 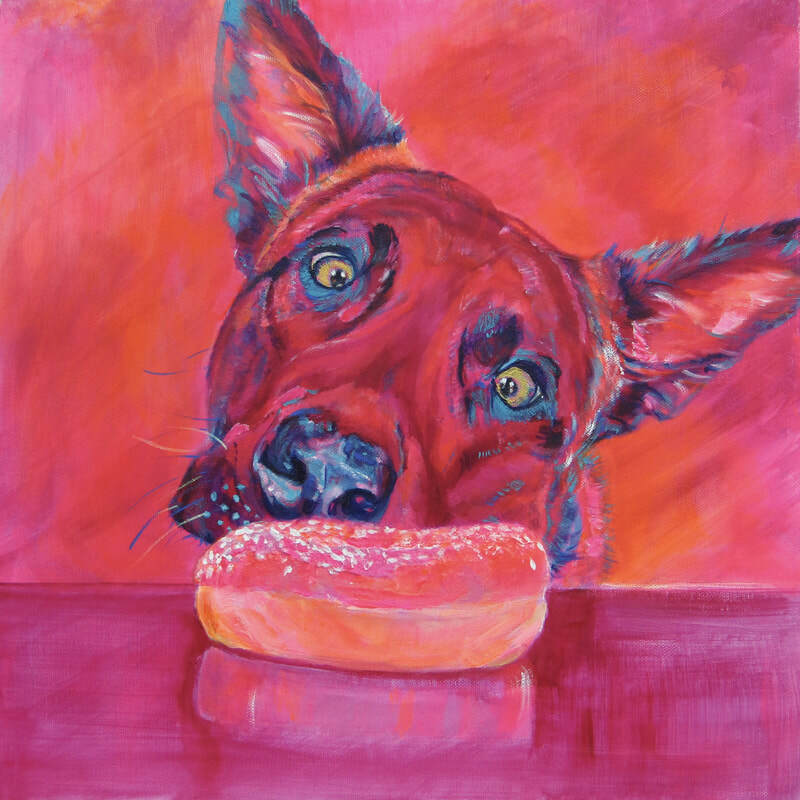 Colour is pivotal to my work "
Commissioned portraits have the subjects favourite colours incorporated into them or yours if it is a portrait of your beloved pet or a landscape of a memorable place or view you love. Paintings can be commissioned costing from $350 NZ 12" x 12" - $2500 for over 1 metre pieces depending on size of painting required and if a portrait how many people or animals will be painted. As a painting of three takes a lot more hours/weeks to paint than a single person. I take a lot of care and time over my commissions as I want the recipient to be very happy with their painting. Her work can be found in private collections in Australia, Wales, England, Scotland, Canada, New Zealand & the USA. All paintings & sculptures unless otherwise stated are for sale by artist.